Peroxidase Assay Kit | Cell Biolabs | Cell Biolabs, Inc. The OxiSelect™ Hydrogen Peroxide/Peroxidase Assay Kit is a sensitive quantitative fluorometric assay for hydrogen peroxide or peroxidase activity levels. In the presence of HRP, ADHP reacts with H2O2 in a 1:1 stoichiometry to produce highly fluorescent Resorufin. The Resorufin product can be easily read by a fluorescence microplate reader with an excitation of 530-560 nm and an emission of 590 nm, or for absorbance at 560 nm. 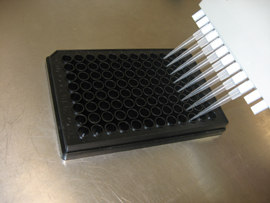 Fluorescence values are proportional to the H2O2 or peroxidase levels within the samples. The H2O2 or peroxidase content in unknown samples is determined by comparison with its respective standard curve. Son, D.J. et al. (2016). Novel synthetic (E)-2-methoxy-4-(3-(4-methoxyphenyl) prop-1-en-1-yl) phenol inhibits arthritis by targeting signal transducer and activator of transcription 3. Sci. Rep. 6:36852. Begieneman, M.P.V. et al. (2016). Dopamine induces lipid accumulation, NADPH oxidase-related oxidative stress, and a proinflammatory status of the plasma membrane in H9c2 cells. Am. J. Physiol. Heart Circ. Physiol. 311:H1097-H1107. Ye, F. et al. (2016). High glucose induces reactivation of latent Kaposi's sarcoma-associated herpesvirus. J Virol. doi:10.1128/JVI.01049-16 (#STA-344). Lara-Chavez, A. et al. (2015). Global gene expression profiling of two switchgrass cultivars following inoculation with Burkholderia phytofirmans strain PsJN. J Exp Bot. doi:10.1093/jxb/erv096 (#STA-344). Zhao, X. et al. (2014). Cleaning up after ICH: the role of Nrf2 in modulating microglia function and hematoma clearance. J Neurochem. 133:144-152 (#STA-344). Bak, J. S. (2014). Lignocellulose depolymerization occurs via an environmentally adapted metabolic cascades in the wood‐rotting basidiomycete Phanerochaete chrysosporium. Microbiologyopen. 4:151-166 (#STA-344). Bucekova, M. et al. (2014). Honeybee glucose oxidase—its expression in honeybee workers and comparative analyses of its content and H2O2-mediated antibacterial activity in natural honeys. Naturwissenschaften. 101:661-670 (#STA-344). Kalyan, S. et al. (2014). Neutrophil uptake of nitrogen-bisphosphonates leads to the suppression of human peripheral blood γδ T cells. Cell Mol Life Sci. 71:2335-2346 (#STA-344). Yuan, D. et al. (2014). Maternal dietary supplementation with two sources of selenium affects the mortality and the antioxidative status of chick embryo at different developmental periods. Int J Agric Biol. 16:629-633 (#STA-344). Ishida, T. et al. (2014). The effect of dihydropyrazines on human hepatoma HepG2 cells: a comparative study using 2, 3-dihydro-5, 6-dimethylpyrazine and 3-hydro-2, 2, 5, 6-tetramethylpyrazine. J Toxicol Sci. 39:601-608 (#STA-344). Bak, J. S. (2014). Extracellular breakdown of lignocellulosic biomass by Dichomitus squalens: peroxidation-based platform and homeostatic regulation. Biotechnol Lett. 37:349-358 (#STA-344). Yun, H. M. et al. (2014). PRDX6 Exacerbates Dopaminergic Neurodegeneration in a MPTP Mouse Model of Parkinson's Disease. Mol Neurobiol. doi: 10.1007/s12035-014-8885-4 (#STA-344). Bak, J. S. Electron beam irradiation enhances the digestibility and fermentation yield of water-soaked lignocellulosic biomass. Biotechnology Reports. 4:30-33 (#STA-344). Kao, C. L. et al. (2014). Vestibular rehabilitation ameliorates chronic dizziness through the SIRT1 axis. Front Aging Neurosci. 6:27 (#STA-344). Majtan, J. et al. (2014). Methylglyoxal may affect hydrogen peroxide accumulation in manuka honey through the inhibition of glucose oxidase.J Med Food. 17:290-293 (#STA-344). Kim, E.Y. et al. (2012). Sustained Activation of N-Methyl-D-Aspartate Receptors in Podoctyes Leads to Oxidative Stress, Mobilization of Transient Receptor Potential Canonical 6 Channels, Nuclear Factor of Activated T Cells Activation, and Apoptotic Cell Death. Mol. Pharmacol. 82: 728-737 (#STA-344). Kim, E.Y. et al.(2012). Insulin Increases Surface Expression of TRPC6 Channels in Podocytes: Role of NADPH Oxidases and Reactive Oxygen Species. Am J Physiol Renal Physiol. 302:F298-F307 (#STA-344). Lee, S.H. et al. (2016). Proteomic analysis indicates activation of reactive oxygen species signaling during seed germination and seedlings growth in Hordeum vulgare (barley). J. Prot. Proteom. 7:269-277 (#STA-844). Douglas, D. N. et al. (2016). Oxidative stress attenuates lipid synthesis and increases mitochondrial fatty acid oxidation in hepatoma cells infected with hepatitis C virus. J Biol Chem. 291:1974-1990 (#STA-844).